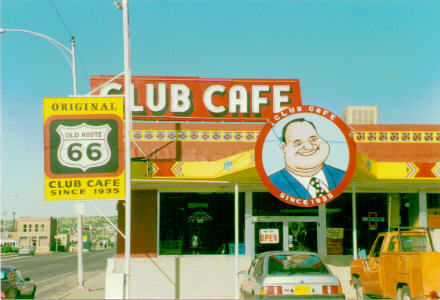 More images from the recent past along Route 66:. Welcoming handout and receipt ($10/night plus tax! 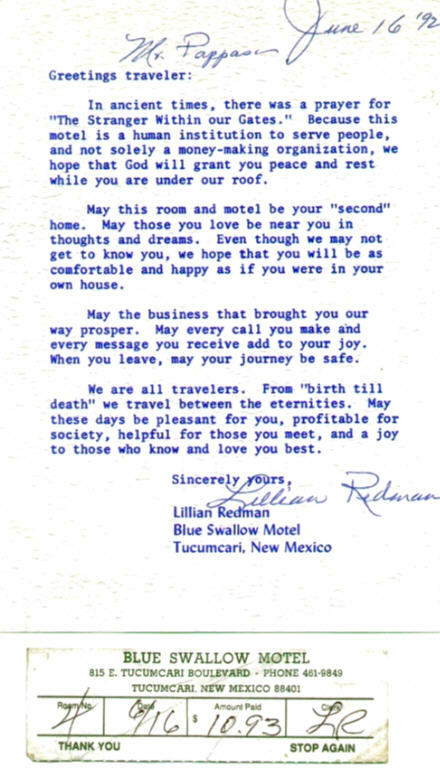 ), Blue Swallow Motel, Tucumcari, NM. The motel is still there, but owner Lillian Redman died at 89 in 1999. 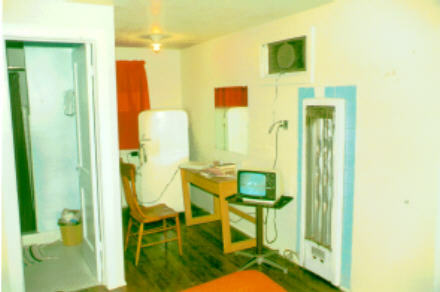 Interior of room at the Blue Swallow, 1992. The rooms have since been renovated and modernized! Club Cafe, Santa Rosa, New Mexico, June 17, 1992. After operating continuously since 1935, it closed two months after I ate there. 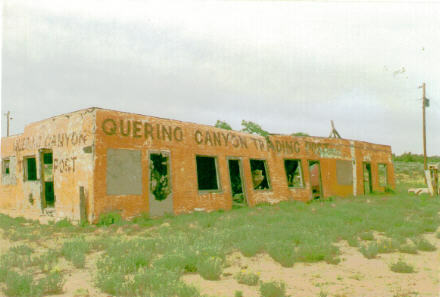 Abandoned Querino Canyon Trading Post, on a long-bypassed stretch of Route 66, 1992. When I passed through here again a few years later, the building had collapsed. 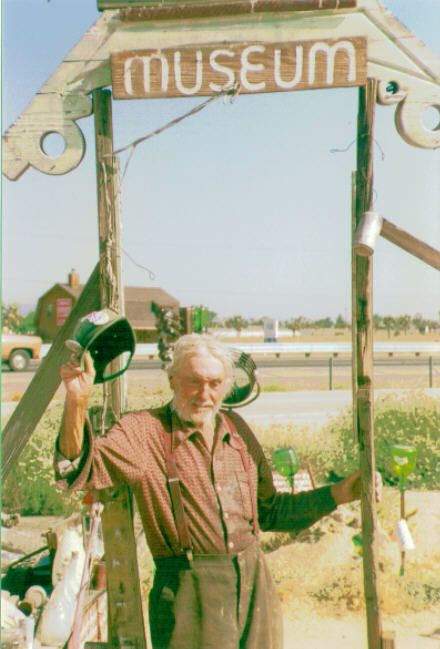 Miles Marion Mahan, retired carny, welcoming me to "Hula Ville," his roadside oasis near Hesperia, CA, June 1992. Mahan had just turned 96 years old! 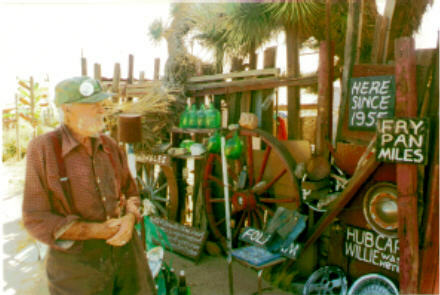 Mahan at the entrance to his "Hula Ville" museum. 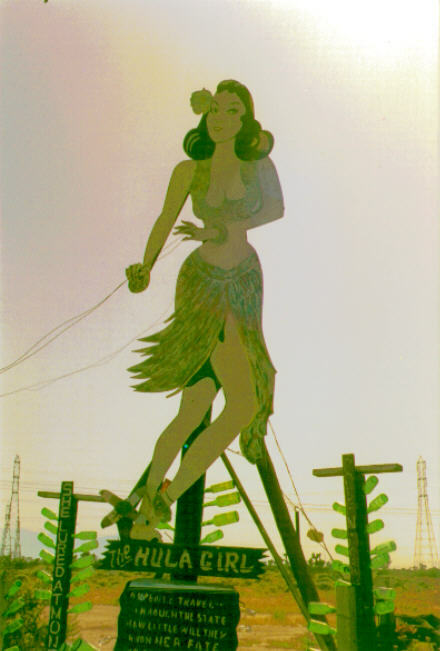 "Hula Ville" was constructed by the side of Route 66 in 1955, and stood until 1996. Hula Girl carving at Hula Ville. 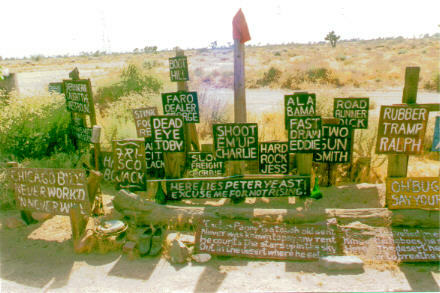 Mahan's work was officially recognized by the State of California as Historic Landmark #939 (Twentieth Century Folk Art Environments (Thematic)). Mahan's plaques at Hula Ville. Many of the Hula Ville artifacts are now displayed at the California Route 66 Museum.